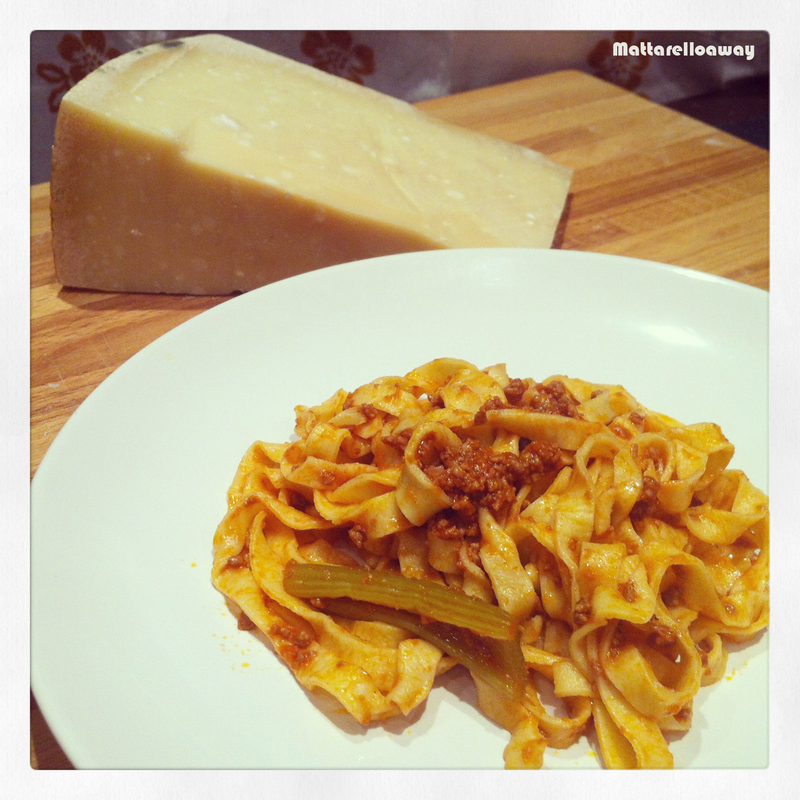 This is my grandma's recipe for the most typical dish from Emilia-Romagna region of Italy. Obviously, there are many varieties when it comes to both ingredients and method when making ragù and this version of mine, to me is the only, true ragù. The main characteristic of my grandma's recipe is in the fact that the herbs and spices, apart from onion, are left whole and as such they give away they aromas slowly through out the whole cooking process. Yet the sauce is smooth, almost creamy in texture. Dice the onion finely, clean the carrot and celery and cut them both in halves. Heat the three fats (oil, butter and lard) in a heavy-bottomed pan and brown the onion. If you prefer "light" version, you can use just olive oil. When onion is brown and ready, add the ground meats and salt and pepper to taste. Pan fry for about 10 minutes on medium heat, stirring in the minced and breaking it with a fork. Add a glass of dry white wine and let simmer uncovered until reduced. At this point add the tomato puree, carrot, celery and chili. Cover and let simmer slowly over low heat for at least 3 hours, occasionally stirring the sauce with a wooden spoon and checking it for salt and pepper. Last 30 minutes of cooking time let simmer semi-covered in order to get the perfect sauce Bolognese consistency.